ABOVE: Commuters and shoppers mingle on a Venice pedestrian thoroughfare. 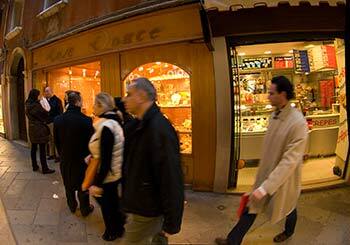 Shopping isn't free in Venice, but window-shopping is--and there are plenty of boutiques to ogle or browse. High-fashion and luxury goods are in the San Marco area, mostly in the streets that lead out of the arcaded or Napoleonic end of the Piazza. You'll find upscale brands like Missoni, Prada, Bottega Veneta, Bulgari, and Gucci in San Marco, along with more affordable (and practical) shops like Libreria Mondadori and Libreria Studium, two bookstores that have a good range of English-language guidebooks and maps. Head down the Mercerie shopping streets toward Rialto, or in the direction of the Campo San Stefano, and you'll encounter hundreds of other shops that sell everything from clothing to handmade stationery, Murano glass, and art supplies. To the north and east of the Piazza San Marco, in the Castello district, shops like I Tre Mercanti (Italian foods and wines), and Ratti (housewares, hardware, and acqua alta boots) are worth your time. Farther west in Cannaregio, on the way to the railway station, the wide pedestrian thoroughfare of Strada Nova has a mixture of souvenir stores and everyday shops used by Venetians--including a branch of Venice's best supermarket (Billa) and a resolutely old-fashioned pet store on the Campo SS Apostoli.